I remembered an interview with CART champion Alex Zanardi in the late 1990s where he was asked what he would want out of a race season. Instead of getting into specifics of how many races or where he foresees himself at the end of the race season, Zanardi responded he just wanted to leave the season with "no regrets". A man of terrific spirit and passion, Alex Zanardi's words have been a drive I am still envying. One thing I have a lot of in life and the early part of my writing career is regret. There have been opportunities I have missed, times I have been too slow and other occasions where I needed cooperation I never received. Recently, my improving presence through this website as well as with other publications has given me a chance to begin to vanquish some regrets. 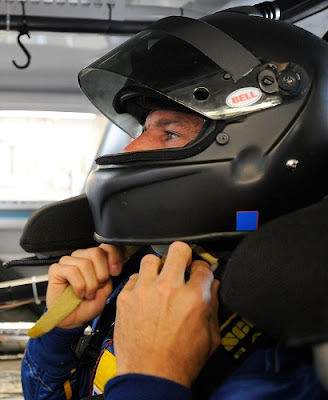 I object which has truly sat as a lost opportunity in the early stage of my career came as a result of an interview with then-NASCAR Sprint Cup driver Patrick Carpentier. In 2008, it was my goal to obtain an interview with Carpentier as a prelude piece to the year's NASCAR Nationwide Series event in Montreal. Thanks to the gracious efforts of Gillett Evernham Motorsports representative and of the French-Canadian driver, I received some valued insight on the former Champ Car contender's migration to NASCAR. Having the material for an original article, I was unable to attract several established publications. 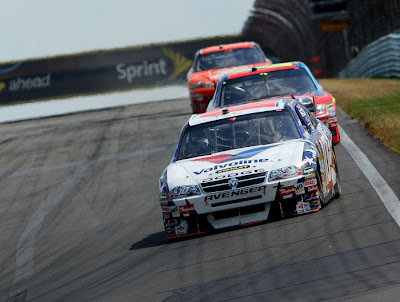 Complicating matters was also the sudden departure of Carpentier from the #10 Valvoline Dodge near the end of the 2008 Sprint Cup season. However, as the 1996 Toyota Atlantic Series champion Patrick Carpentier proceeds with retirement from professional motorsports following the 2011 NAPA Auto Parts 200 in Montreal, I felt this was the best chance to share my unique interaction with the French-Canadian driver. Though dated, it is my pleasure to grant XSL Speed Reporter readers with this question and answer collection. XSL: Up until a few years ago, had you ever considered the prospect of driving a stock car? PC: I think it was something I had always wanted to do, but it seemed like it would be quite a hill to climb to break into NASCAR. My manager and I really started getting the word out in 2005. That’s when it really hit me as to how much of a challenge it was going to be. XSL: When did it become decisive to pursue a NASCAR career? PC: I don’t know if it ever became decisive. I just knew that I didn’t want to be involved in CART or the IRL anymore. Sometimes you just know when it’s time to turn a corner in your career. So if I wanted to continue racing NASCAR just seemed like the next step. XSL: Being a NASCAR Sprint Cup rookie, do you believe that you have earned the respect of your competitors? PC: I’ve been doing my best. Some of the guys on the NASCAR circuit have been doing it for years and it’s hard to gain their respect, especially when you have a yellow rookie strip across your bumper. But there are things I’ve been doing. I have been trying to race clean, smart and show all the guys respect both on and off the track. Anytime the guys come and offer me advice I always listen and use as much info as they can give me. I think that helps. I may be a veteran racer but this year I’m still a rookie in NASCAR so sometimes it pays off when you listen and learn. XSL: Is there any major changes to your more established professional routine resulting from the race schedule that runs nearly twice as longer than open-wheel series? PC: It’s been different. I mean here the schedule is so long. I think it’s like 36 races in 42 weeks or something like that. So it takes a lot out of you, whether you’re prepared for it or not. But what most people don’t realize is how many other commitments the drivers have. A lot of times we’re needed for sponsorship appearance and we may spend the next two days testing. Then it’s off to the next race. So it’s been a unique transition for me, since my family and I still live in Vegas. XSL: With limited pre-season testing, what resources have you been able to use to adjust to lesser familiar race tracks? Have your experience racing ovals with Champ car and Indy car proved useful? PC: I do a number of things. Dover is a good example. That’s a track that I had never seen before showing up to race. Gillett Evernham Motorsports is quite helpful and they’ve supplied me with a number of resources. I’ll start the week off by using a race simulator to help me get an accurate visual of the track from behind the wheel. I’ll also watch in car footage from the races at Dover last year. Kasey’s in-car footage from last year was in my DVD player in the week before Dover. I get some reports from the other drivers and data from last year about those tracks I’ve never visited. Unfortunately there isn’t very much from my open-wheel experiences I can use because the cars differ so drastically. It’s a much different feeling getting around the tracks in Champ Car at 235 mph than in a stock car at 180 mph. In open wheel there is so much more downforce on the car. The cars are light and the tires are very wide. They’re built for speed. In these stock cars you need to have a lot more car control. It takes a little more finesse to muscle them around the track. The cars weigh more and they’re always slipping and sliding around. When you’re out there running with 42 other cars that are slipping and sliding equally, it makes things much more challenging. It’s pretty crazy to watch all the cars around you sliding through and off the corners. XSL: On your website, you blogged after the Dover race about assistance that your teammate Elliot Sadler provided in adopting to the 1-mile oval. With both team cars piloted by veteran Sprint Cup drivers, have they been helpful in accelerating your adaptation to the series (On and/or off track)? PC: Everyone at Gillett Evernham Motorsports has been extremely helpful to me this year. It’s a very unique situation that we have here. I mean here I am with years of racing experience under my belt. But in NASCAR I’m still just a rookie driving the Valvoline Dodge. And sometimes I feel like one. There so much to learn in the sport and that’s where Elliott and Kasey come in. Anytime I have a question or want to better understand something they’re who I go to first. Elliott’s been racing in the Cup Series for years and as over 300 starts. He was especially helpful this year at Daytona and Talladega. Those are both restrictor plate tracks and he took me under his wing to understand the draft a little bit better. It really helped me out. XSL: What would you regard as your most positive experience so far this year on and off the track? PC: I don’t think I could pick one. There’s been several. I think qualifying fourth at Richmond in the LifeLock Dodge was a big one. We ended up getting wrecked out of that race but I learned so much running up front with the leaders. Darlington was another. It’s a tough, old track and we managed to lead four laps there. We didn’t get the finish we deserved at Michigan but it still ended up being our second best of the year [24th]. We had a top-15 in our sights before getting caught up in another wreck. But we’re going to start heading back to these tracks for a second time and I think that’s when you’ll see this team start performing better. XSL: Canadian have long supported NASCAR, even when the presence of our country's native drivers are limited to just a few races a season. 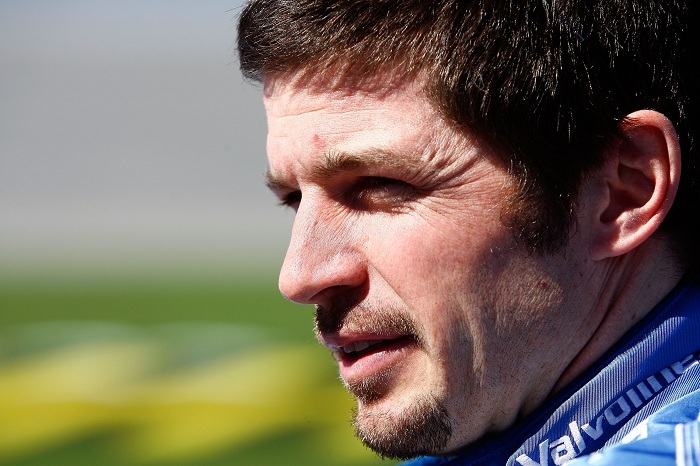 With your full-time ride with Gilliet Evernham Motorsports, Alex Tagliani is running in the NASCAR Canadian Tire Series, and Paul Tracy has just recently tested a Craftsman truck, would you agree that this new focus on NASCAR may have been overdue? PC: I don’t know if I’d say overdue. It’s all about timeliness. I mean a few years ago no one would consider taking a chance on an open-wheel driver in NASCAR. They’d look to pull someone from the sprint cars or midget cars. But trends change. That’s what happened here. Now it’s the thing to do. Try and open-wheel driver and see how they do. Either way it’s good to see Canadian’s involved in motorsports and getting recognition for it. It’s such a challenge to succeed at these levels. XSL: Your road course prowess his been well-exhibited in a stock car, supported by your success outing at Mexico City this year. Are you looking forward to the Infineon Raceway and Waltkin's Glen? PC: I like racing at any track but I prefer ovals. Road racing is fun, it’s just a different kind of animal. In the years I spent in open-wheel I learned a lot on the aspects of road racing. But driving a stock car on a road course is quite the chore. With all the weight that’s involved in slowing down a 3,400 pound stock car it can really wear your brakes out.